We have long been fans of On Running shoes here at Run247. On the road the ‘clouds’ (the lugs on the sole) which deliver their trademark soft landing and firm push-off, are a definite winner. The build quality of the shoes is always very high, as you’d expect from classy Swiss engineering, and they are just a joy to run in. The popularity of their road shoes continues to grow and grow and they’ve developed from a small company into one which takes on the huge brands in only eight years. But one thing they would really love to do is conquer the trail market. On were born in the Swiss Alps and those trails are where their heart is. They launched the original Cloudventure shoe two years ago. 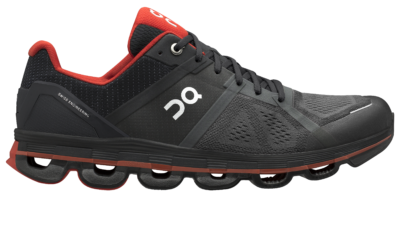 It had a lot of positives – it was incredibly comfortable and cushioned to run in, it was sturdy and protective on the trails. However, it’s fair to say it had a couple of negatives – the grip was fine for harder trails but it wasn’t great in mud, and the clouds weren’t that durable if you subjected them to a lot of rock. Step forward the new Cloudventure. They’ve really made some big changes. From the new MissiongripTM outsole to the new formation of the clouds on the sole, it’s a very different shoe which has addressed the weaknesses of the first version. As you’d expect from an On shoe, it feels very cushioned underfoot right from the off. But it does feel a little rigid at first and I found it rubbed slightly on my ankle for the first couple of wears. But the collar of the shoe is very soft so it’s a minor niggle. The toebox is reasonably wide and the heel was snug and comfy. The upper and tongue of the shoe are really soft and there’s no rubbing at all. 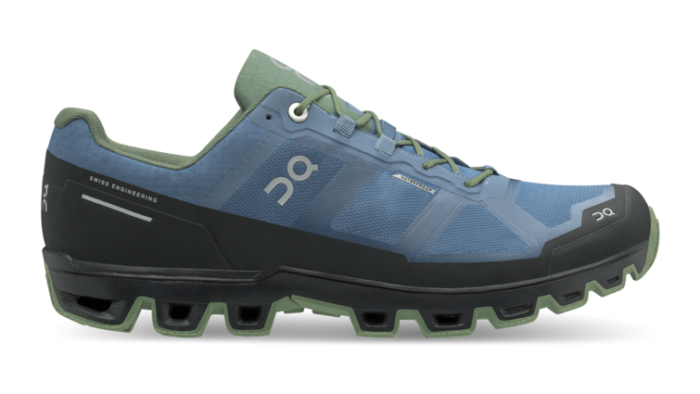 All in all it’s an incredibly comfortable shoe, particularly for a trail shoe. The big question mark about this shoe was always going to be the grip. To maximise the grip On has created a new MissiongripTM overlay of sticky rubber which sits on top of their trademark clouds. The surface of the rubber has zig zag designs to create traction on slippery surfaces. In addition to this big change the clouds and their configuration are also much changed from the first version of the shoe. They now feel a bit more ‘stud-like’ and not too dissimilar from something like the inov-8 Roclite. They are definitely a lot more robust than the original Cloudventure clouds, but they still maintain the soft landing and firm push-off. 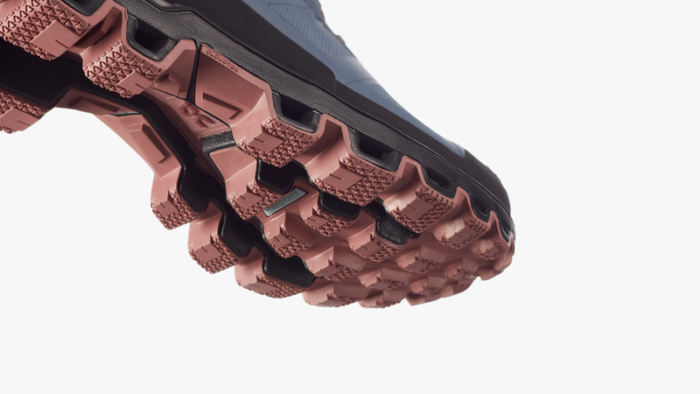 I’ve tested these shoes out for around 200 miles of running now and I’ve tried them on every surface – road, woodland trail, rocky trail, mud, fells, snow and ice – and for up to four hours. if I’m really honest what I’d expected was that they’d be really good on hard packed trails but not so good in mud. However, I’ve been really pleasantly surprised. They grip and provide a lot of cushioning and protection on every surface, including rock and mud. I’d have no hesitation in wearing these shoes on anything but the muddiest of runs and they’re a definite asset on longer runs on hard terrain because they absorb so much of the shock from the ground. 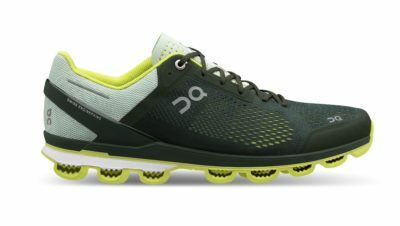 I have to admit that I was just expecting this shoe to be a minor update from the previous version – that’s to say I thought it would be a good, cushioned shoe for hard trails but not so good on mud or rocky stuff. But I’m happy to say that I was wrong – this is a major update with big improvements. If you’re a fan of On road shoes you will find a lot that’s familiar and enjoyable about their trail shoe. 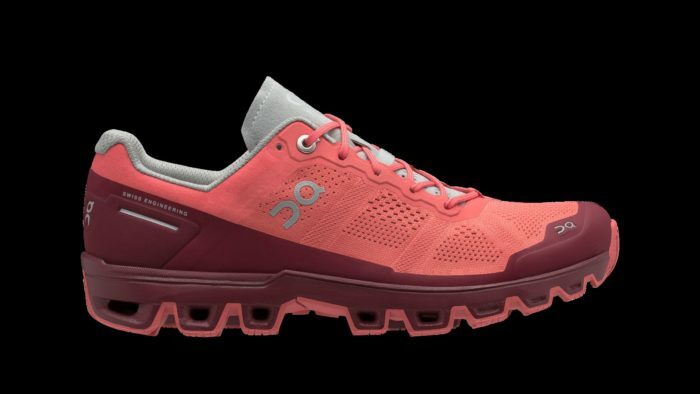 And if you’ve never tried On shoes before I’d say this is just a great, rugged, lightweight trail shoe, which will handle most conditions and provide lots of lovely cushioning. Find out more about the On Cloudventure HERE.